Durham University is a university in Durham, United Kingdom. It was founded as the University of Durham (which remains its official and legal name) by Act of Parliament in 1832 and granted a Royal Charter in 1837. It was one of the first new universities to open in England for more than 600 years, and claims to be England's third oldest after Oxford and Cambridge (although other higher education institutions also make this claim – see third oldest university in England debate). It stands in Durham, on the River Wear, and in Stockton-on-Tees. Durham is a collegiate university, with its main functions divided between the central departments of the University and 16 colleges. In general, the departments perform research and provide centralised lectures to students, while the colleges are responsible for the domestic arrangements and welfare of undergraduate students, graduate students, post-doctoral researches and some University staff. Colleges decide which students they are to admit, and appoint their own fellows (senior members). 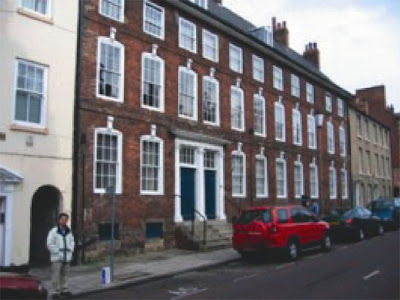 In Durham, "the university" often refers to the University as opposed to the colleges. The Chancellor of the University is Bill Bryson, appointed by the University's Convocation on 4 April 2005. The University was named Sunday Times University of the Year in 2005, having previously been shortlisted for the award in 2004. The post-nominal letters of graduates have "Dunelm" attached to indicate the university. The University was founded in 1832, and developed in Durham and Newcastle until 1963, when the independent University of Newcastle upon Tyne came into being. 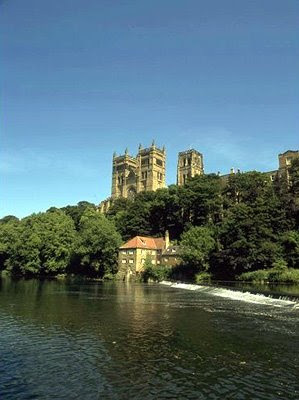 The University is collegiate and is located in the city of Durham and the nearby town of Stockton-on-Tees. The colleges are not teaching bodies, nor are they purely residential - typically they provide a centre for students' sporting, social and residential activities. 2001 First intake of students to Stockton's new Medicine programme. 2001 John Snow College and George Stephenson College established. 2000 University of Durham wins University Challenge (for the second time). 1999 In Stockton, the new student social centre, the Rocket Union, opens. 1997 Durham triumphs in first Northumbrian Water University Boat Race between Newcastle and Durham. 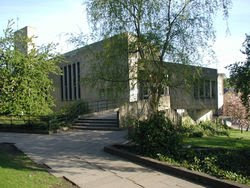 1994 University College, Stockton on Tees becomes a college of the University of Durham. 1992 Sir Peter Ustinov is installed as the University's tenth Chancellor. At the same ceremony an Honorary Degree is conferred on Terry Waite (this was five years after the nomination was originally announced, because he was taken hostage in the Middle East). 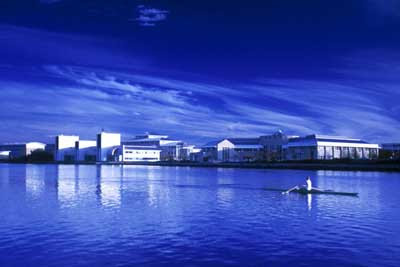 1992 University College, Stockton on Tees opened. 1989 The University runs its first British Sign Language course. 1988 Paulina Lubacz becomes the first woman to run a British university finance department. 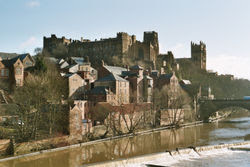 1987 Durham Cathedral and Castle become a World Heritage Site. 1977 University of Durham wins University Challenge. 1908 George Kitchin, Warden since 1894, becomes the first Chancellor. 1904 St Chad's Hall opens as the first independent licensed hall. 1896 The first four women students matriculate, all of them members of St. Hild's College. 1895 Royal Charter granted to allow degrees to be given to women. 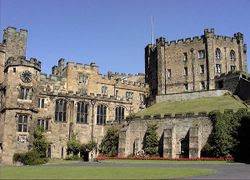 1837 Durham Castle handed over to the University. 1837 Royal Charter granted to the University by King William IV on 1 June. 1832 Establishment of the University of Durham by Act of Parliament, gaining royal assent on 4 July. 1831 The cathedral chapter resolves to establish an 'Academic Institution or College or University'. The teaching departments of the University are divided into three faculties: Science, Arts and Humanities, and Social Sciences and Health. Each faculty has a Dean and one or more Deputy Deans. These, along with the heads of the departments in the faculty, the Vice-Chancellor, and the Pro-Vice-Chancellors, make up the Faculty Board for that faculty. Each department also has a Board of Studies consisting of the Dean and Deputy Dean of their faculty, the teaching staff of the department, and student representatives. See also Natural Sciences, one of the largest degree programmes. Department of Theology and Religion. Durham students are heavily involved in voluntary activities in the community. The number of projects has grown significantly from 23 to 77 in the last 8 years and there are currently 730 students across both campuses involved as volunteers working on community projects. Teaching Quality Assessments by the QAA have rated Durham at an average of 22.2/24 in 2003, above the UK average of 21.6. 57th in the world by The Economist in 2006 for Durham University Business School's MBA (62nd in 2005). 82nd in the world by the Financial Times in 2004.